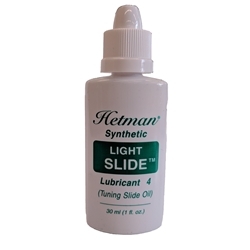 Hetman Light Slide Oil is formulated for tighter fitting valve slides and valve slides of longer length. Hetman® Synthetic Slide Oils are formulated for first and third valve slides (trumpets, cornets, etc.). These lubricants are designed to maintain an airtight seal and smooth slide action when making intonation adjustments. The proper choice of viscosity grade depends on the fit and length of your slides. Generally speaking, lighter viscosities are needed for tighter fitting and longer length slides, whereas heavier viscosities are required for looser fitting and shorter length slides. One should choose the heaviest viscosity that still allows rapid slide movement. Packaged in 22 ml bottles with special dropper tip applicator. Available in three nontoxic, non-gumming, long-lasting viscosity grades: Light, Regular & Heavy.